Well, it’s been a long time coming. Joe’s been trying to get me to contribute to Super Sonido for a while and I finally got it together to drop a little some’n some’n. My pick is a track by a little known singer named Pepito Quechua. On this track he is backed up by the amazing Grupo Celeste some of whom went on to back up the immortal Chacalon in his band “Chacalon y La Nueva Crema“, an amazing Chicha band that is widely considered the “official” sound of Chicha. Anyways, I thought I’d also post the rebajada version, considering that it is the way I prefer to play a lot of my 45’s. This subject will take a bit longer to get into, and I plan on droppin a rebajada mix here very soon, but for the peeps that don’t know, rebajadas are slowed down tracks that change the song entirely and give it a different more laid back rhythm and makes the vocals sound like they’re sippin on syrup, if you know what I mean. 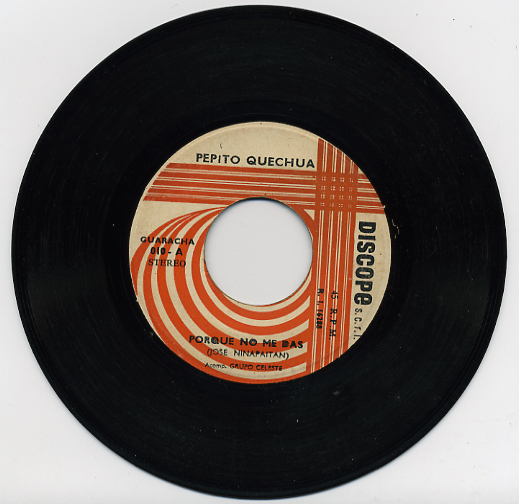 Anyways, there’s a lot of theories as to who, how, and why did rebajadas start, but I chalk it up to the fact that super fast Descargas & Guarachas from Peru & Colombia actually sound a hell of a lot more like Cumbia when the 45 is played at 33 RPM. Theories about record players with dying batteries are good stories, but I think people just dig the doped out style. Forgive the skip at the end, Enjoy! Thanks DJ Lengua for the amazing post and Quechua lessons. You can catch visual artist, musician, and my number one homeboy Dj Lengua spinning records @ Mas Exitos a biweekly event every 2nd and 4th Tuesdays @ the Verdugo in Los Angeles. And when he’s not being artistic you can find him driving his truck around L.A. with his wife Gina and their dog Pepino. Keep posted for future Lengua mixes and other joint posts on Super Sonido. Just to elaborate, rebajada is a popular dj style in Mexico. I wanted to point out that some dj’s take super fast gaitas and slow them down to a more danceable beat. Lengua and I will collaborate on a post sometime in the future. That video is funny as hell. I think Pepito Quechua was drinking too much chicha. Great post! I demand more DJ Lengua appearances in this blog! that video is priceless! the repartee is pretty rapid-fire, and hella crude–vaudevillian crude, with tons of play on ethnicity and language. I like it alot. And the track(s) Lengua hooked us up with is straight!